First, we recommend you to install the AFS Analytics WordPress Plugin. AFS Analytics will be installed and automatically updated on your website pages. How to install AFS Analytics WordPress Plugin. You would like measure and analyse your WordPress Website traffic without AFS Analytics Plugin. The installation of the AFS Analytics tracking code on your Wordpress website is simple and takes less than 5 minutes. 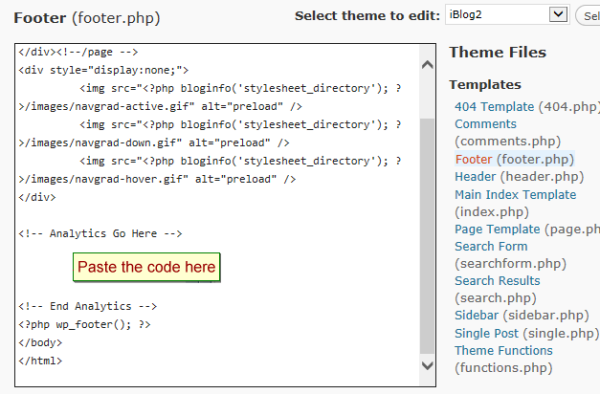 To install the AFS Analytics tracking code on your Wordpress website , here is a step by step guide. 1)	First you need to open an account on AFS Analytics. 2)	Next you need to log in to your Wordpress dashboard as usual. 3)	On your dashboard find the “appearance” tab that is located on your left sidebar and hover on it. Now select “Editor” link from the options provided. 5)	Locate the “!-- Analytics Go Here --” line in the footer.php file and then paste the AFS Analytics tracking code after it. 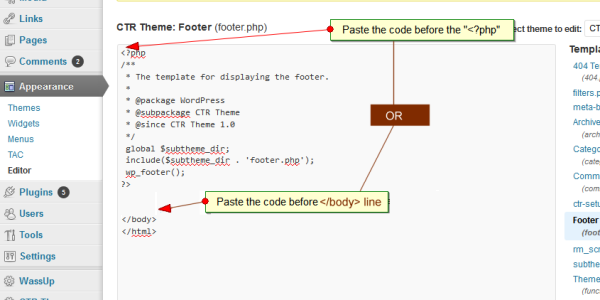 6)	If you don’t find the previous line paste the code before “?php... wp_footer(); ?” or “/body” line. It is important to note that this method of installation will require you to repeat the installation incase the theme of the website is changed; this is because the installation of the code is done into the footer.php file of the theme and not on the site. To get access to your wordpress website statistics, log into your AFS Analytics account.